They may call themselves Sleepy Sun, but the sun certainly did not sleep in today for the San Francisco band's set. Nope, there are few clouds in the sky, and plenty of guitars on stage. That's been the theme so far as this year's LouFest: electric glory. All three bands who have played so far have turned up the volume for the fans who've decided to come out early. I have a feeling that will continue later tonight with Deerhunter and The Hold Steady. Sleepy Sun is a band whose sound may not be exciting for some, but their version of slow-churning rock sounds just fine to me. Hey, I even heard a harmonica -- the first one today! 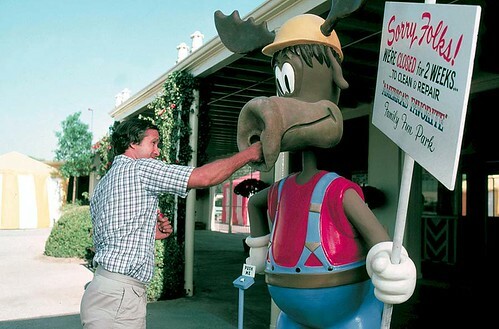 (Sorry, folks, no banjos, moose out front shoulda told ya.) Their sound reminds me of The Black Angels; maybe not quite as awesome, but not far off. Plus, the lead singer had the crowd almost raise the roof. This is all happening. Right. Now. I'll be back in a few to report from the Kids Stage, where the youngsters have been rocking for almost a couple of hours now.